Black Friday weekend is officially upon us, and so many different brands have finally come forward with their discounts for the season. iZotope — one of the biggest names in audio editing and processing, certainly did not disappoint this year, after announcing website savings which reveal the lowest prices ever for the company. With all of these 9 plug-ins and bundles from iZotope combined together into one purchase, these offers bring a total normal retail price of $6,927 down to just $1,841. For a total average savings of 73.5%, which can be summed up by just one word — WOW. All of these exclusive deals are currently available on the iZotope website, and although this Black Friday promotion currently does not have an advertised end date, one can easily assume these savings will be going on through the end of the weekend, which may, or may not also include Cyber Monday. So we highly recommend hopping over there now to fill your basket with these plugins and bundles before their prices hike back up by the end of the weekend. 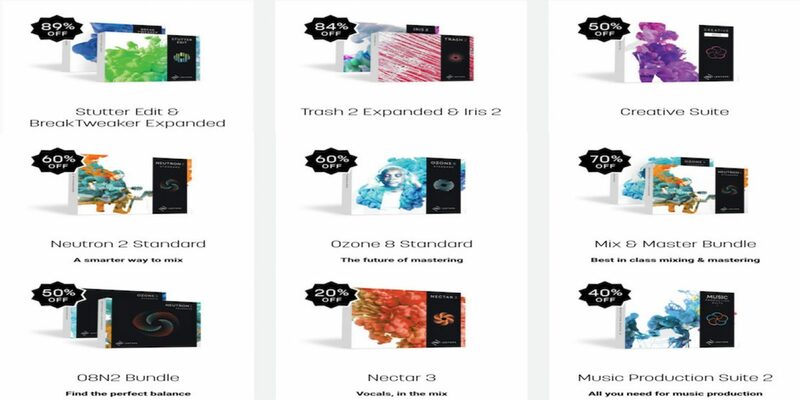 And for even more Black Friday offers on iZotope products, we also recommend heading over to Plugin Boutique, which is also offering savings on more great iZotope plugins, including this great deal for a free copy of iZotope Neutron Elements. Happy shopping!